The original purpose of my trip to Singapore was to watch a concert. And then it got cancelled a week before the concert date. Airline bookings had already been made so I still decided to push through. So on this particular trip to Singapore I just made it key purpose to eat. Primarily to seek out some good fish head curry and some salted egg crab among other things. 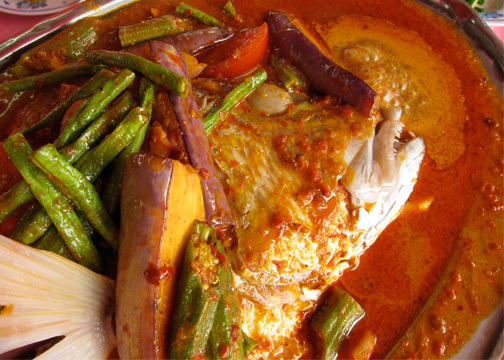 And funny enough, just outside my friend’s flat was one of Makansutra’s choice picks to have some fish head curry called B.K. Forture Seafood Steamboat. And no, that’s not a typo. Forture was previously called Fortune as you might have suspected. It was a feng shui master’s suggestion to change the N to an R for better business; and it seemed to work out for them just fine ever since. 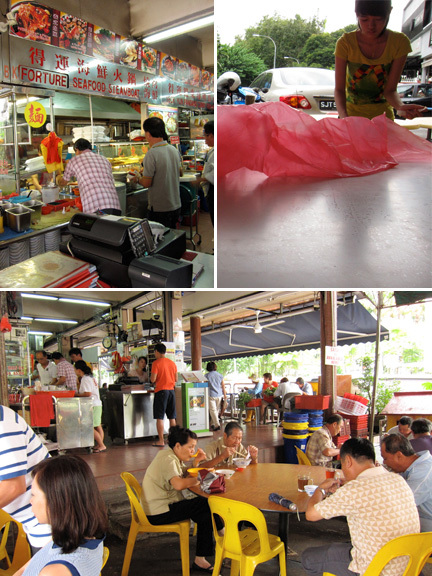 It’s located in a relatively small corner food center and has outside seating as well as an air-conditioned section. Though it’s still regarded as what locals call “zhi char”, or a food stall that serves up a wide variety of a la carte Chinese dishes. The regulars usually order bowls of noodles or roasted meats and rice; and it’s usually the foreigners (read: us) that order up a seafood storm. 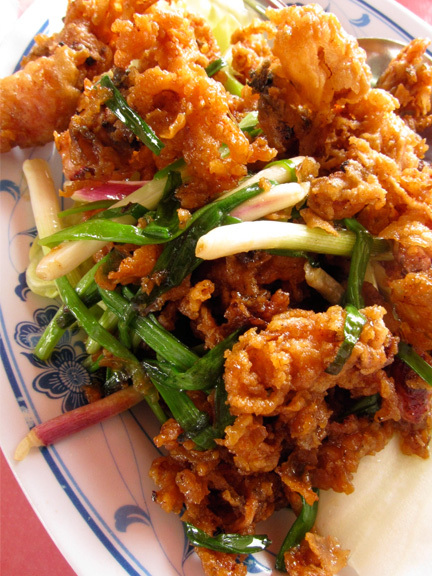 We had placed orders for some Crispy Baby Squid, Assam Fish Head, Salted Egg Crabs and some stir-fried kailan. While waiting for the orders, a female staff rolled out this huge red sheet of plastic, much like a tablecloth, and started taping it on the table. 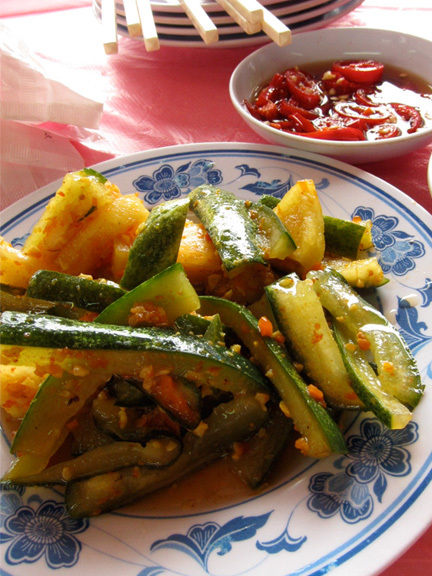 She then efficiently plopped down a plate of excellent pickled cucumbers, chilies, plates, chopsticks and steaming bowls of jasmine rice. First to arrive was the kailan. Still crisp and tasted of wok hei. Pretty standard, though we didn’t really come for the greens. Next came the Crispy Baby Squid. I had to ask if they used fresh squid as the flavor was so intense, as that of daing. It was battered and fried and then tossed in a soy, sugar and chili based sauce. Delicious. We were working the rice bowls at this point. A huge chafing dish then arrived, complete with the flaming heating apparatus underneath. Atop was a platter of massive fish head swimming in this rich, aromatic gravy. The flesh just pulled apart from the grouper and was so tender. 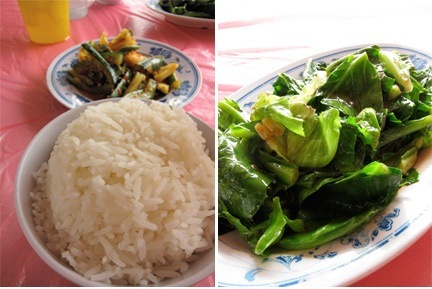 The vegetables were cooked perfectly and the tamarind based broth with the white rice was heavenly. I was thinking the sauce would be more tart from the use of tamarind, but it was surprisingly well-balanced and delicate enough for the flavor of the fish to come through. A symphony of sweet, salty, acid and spiciness that isn’t so heavy as meat curries. 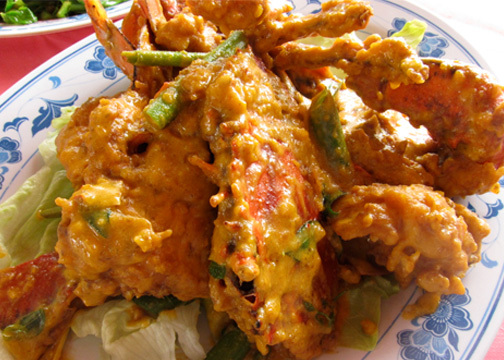 The last dish that arrived was the Salted Egg Crab. We specified a small crab but what came was still something that probably weighed 2 kilos. The claw was as big and meaty as a chicken drumstick. I’m not a fan of chili crabs as I actually prefer black pepper crabs more. But this preparation of crabs is probably my favorite; with the unique sauce/coating obviously making it special. The dish is prepared by first deep frying crabs and then tossing them in a mixture of (lots of) mashed salted duck egg yolks and butter. A fat on fat sauce. This is no doubt very rich. But astoundingly you could still distinguish the sweet, succulent crab meat from the salted egg crust. My pupils involuntarily roll up toward the back of my skull while eating. And after you finish off the flesh, you tend to linger gnawing on the shells to get every bit of that salted egg gold. All in all the total bill was just under S$80 (P2700) for five persons; including the giant Sri Lankan monster crabs. The crab dish alone would’ve easily cost about S$100 in a more popular seafood restaurant. So it’s pretty good value. And not bad for a first lazy lunch in the Lion City. Two items ticked off the to-eat-list in just the first meal; leaving more time to explore other things. What started out as a trip marred by bad luck had suddenly turned a bit more pleasant; a good change in forture..er…fortune.